There are all different kinds of people in the world. And these different people handle things in different ways. There are people who are joyous and there are people who are miserable. There are people who are hilarious and there are people with no sense of humor. There are people who are smart and there are people who…well…aren’t. There are people who have no pain threshold and who cannot handle being sick and there are people who can take whatever you throw at them in regards to sickness and pain. And then there is Travis. Travis has been this way for as long as I have known him. He works through the pain. The sickness. I would say that he ignores it but that would require an acknowledgement of it being there in the first place. He handled kidney stones on his wedding day and did nothing more than joke his way through it. He broke his arm last summer. The doctor told him it would probably require surgery and he could hope for limited use within a month. He was wakeboarding three weeks later. Pain and sickness don’t keep Travis down. Travis has never faced chemo before. Travis began chemo on Thursday. He started the day with some blood work and then met with his rockstar, Dr. Hamrick. Dr. Hamrick feels it is unnecessary to put Travis through the Y-90 radiation until they see that the chemotherapy is working on the lymph nodes. His explanation made sense so they will be holding off on doing that. By the time he got home he could tell his body was…off. Nothing major but his legs were…shaky. Trey’s graduation from preschool was that night so they headed off. As he sat through the graduation he could almost feel the chemo filtering through his body. His legs were definitely getting weaker and he just felt…off. He proudly watched his son “graduate” preschool and then headed home with his father-in-law. He figured some sleep would help. He was in bed by 9:00 pm and he slept. And, once there…he put in almost a full day of work. When asked how he feels he likens it to “growing pains”. Some pain behind the knees…a jolt here or there…but, otherwise, fine. He sometimes gets a sharp pain in his liver but he imagines it is the chemo attacking his liver. He is definitely fatigued and sleeps more than he ever has. But. All in all. He feels…fine. He was up bright and early Saturday morning. He had a commitment to keep. He was walking a 5K. Jones, has a son with cystic fibrosis and today was the annual Great Strides walk to raise awareness and funds for cystic fibrosis. Today, just 36 hours out from receiving chemotherapy, Travis “walked it out” with Team Bryce Bryce Baby to support his friend. Will it always be this good? We can hope. But it is unlikely. The first chemotherapy session can be “easy”. Although, I am not sure they meant this easy. But, as the chemo builds in his system each time, it will become more difficult. The fatigue will become worse and other side effects may arise. 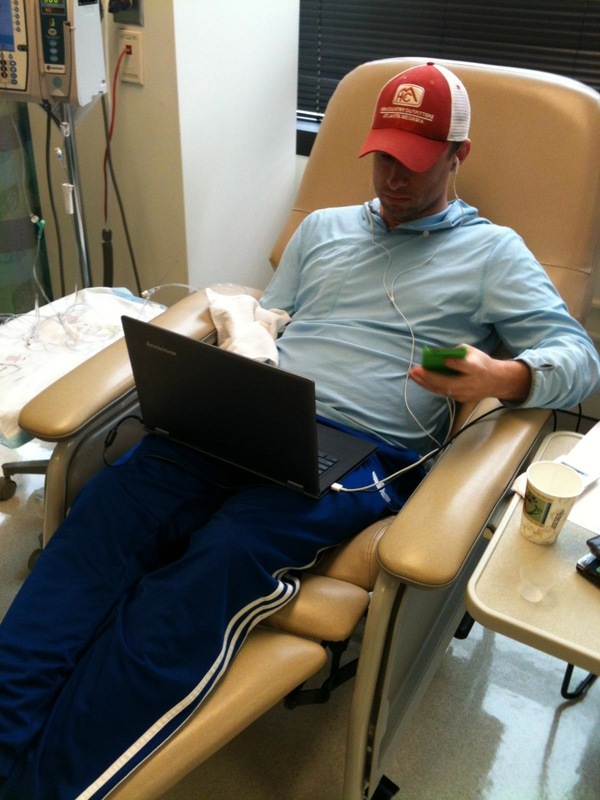 This entry was posted on Saturday, May 18th, 2013 at 2:17 pm	and tagged with chemotherapy, Cisplatin, Dr. Hamrick, Gemcitabine, Great Strides, Travis Roberts, Y-90 and posted in Uncategorized. You can follow any responses to this entry through the RSS 2.0 feed. Glad to hear you are handling the chemo and not that it is handling you:). I heard the same from my doctors and was told I might work a few days after starting chemo/radiation, or at best would only work a day or two each week. I said that would not happen, and it didn’t! The only days I missed were chemo days and surgery days:). Keep strong and keep moving forward. You are in our prayers. Good morning. I read and joined your blog last night. I am a friend of Travis’ mom Cindy at Abbas House. As you already know our God is a Mighty God! In whom ALL things are possible. Last spring thru fall my sister in law had lung cancer. As I began to pray for her God told me to tell her she had an intruder. He would not allow me to call it cancer. Have a hard time calling it that now. As I prayed I would command this intruder to wither and die and go out as waste. Of course in our Healers name. Jesus. Travis is healed by Jesus stripes. .I also would pray that her lungs must line up with the truth of what GOd’s word said concerning her life.Travis sounds like an amazing vessel of God. May the power of God’s mighty touch clear his body and sweep away this intruder. God loves you. May God instill a mighty stability in you as you care for Travis and your sweet babies. The Ultimate Fighter Travis!! Kicking it one step at a time!! So proud of you and the power of prayer!